I just got into smoking cigars and I have come home with some cigars. I have a box of Montecristo Robustos from Cuba and I also have some cigars purchased from one of the tobacco farmers over there(excellent by the way!!!). I love in southern Louisiana where we typically have a high humidity climate. I'm not sure that I will be buying a humidor right away. The farmers cigars came wrapped in a palm leaf and stored in a plastic shopping bag which he says is how they store their cigars for up to 5 years. The montecristos are in the box. Is a tupperdor my best option? Any and all advice would be welcome. Yes and a couple 60 gram boveda packs. Tupidors are great, easy to set up, and a couple o bovida packs and you are all good. The other thing to consider is not just the humidity but also the heat. Make sure you have a controlled climate. Do you think there is anything to the farmer's "natural humidor"? You have no idea what the humidity is or anything. It may do well for a little while, but I wouldn't trust it for any length of time. As @deadman and @TNBigfoot68 stated, you need to have some way to KNOW what the humidity is and they are spot on with what they said. In an area with very little climate fluctuate, and a native humidity of about 70 they may hold up like that. In Louisiana, not so much. I doubt it. It might seem way lower than ideal because you're comparing it to what's outside, like when you first walk in and it feels wonderful. You'll want a good digital hygrometer for your sticks, however you decide to store them; get one, make sure you can trust what it's reading (calibrate if necessary) and leave it near where you store your cigars. I bought some cheap digital hygrometers on ebay, calibrated one of them and use it to check the other ones in my tupperdors. They're all of by 3-6 points, but I don't care because I know how far off they are. The problem is, you want a stable environment. Your house, unless it is a constant 65-70% humidity, will cause problems for your cigars. The fluctuation in humidity can actually cause problems like cracking wrapper, tight or plugging cigars, etc. I live in an area with 70+ humidity, so keeping the humidity down can be an issue. Am I correct in assuming that even though I live in humid climate the rh in my house is way lower than ideal for cigar storage because of the air conditioner? Coolidor/Humidor. Just be sure to take the proper steps to ensure they're at the right temp and humidity level. Just don't store them Bill Clinton style. To calibrate a hygrometer is it necessary to do the salt method or is it possible to use a boveda pack in a sealed container? 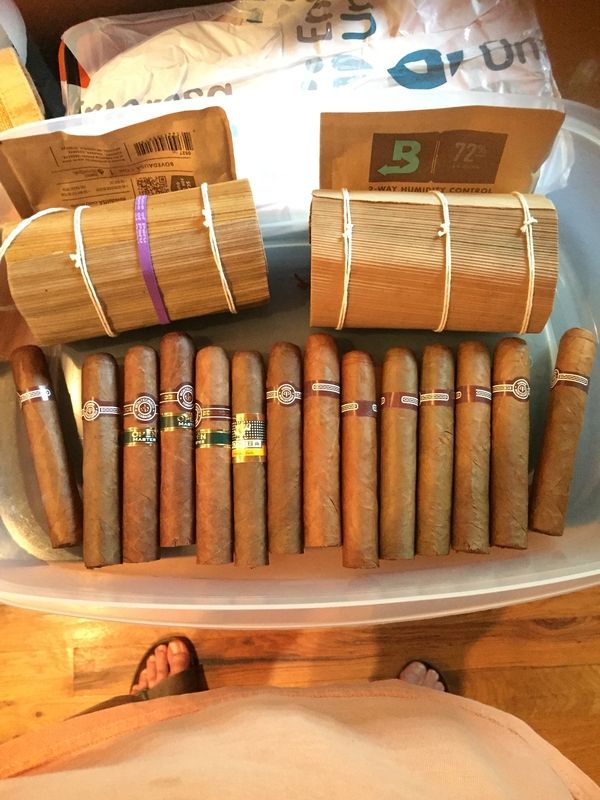 Also when making a tupperdor is it necessary to wait for the rh to stabilize before putting the cigars in or can you just put the smokes in right when you get the boveda packs in there? Put everything in at the same time. Thanks y'all for all of your info!! @0patience I'm a little confused in your answer. Is that a yes you can calibrate with just a boveda packet in a sealed container? There is more that can go wrong with the salt test, so I'd say spring $5 for the boveda thingie. @Heavysetrapier, my advise sense your in a very humid climate is stick with 65% RH for storage, try to keep temperature where stored around 68-75*F. Cubans are IMO more prone to have cigar bettle larva in them so avoid the infestation at going over 75* at all cost, of course this can be avoided by freezing your cigars as others have mentioned. Keep in mind I basically live in a forest, and wind is almost none existent this time of the year also. Heard that TX98. I already ordered the boveda 72% but I can order some 65s as well and then see what the rh sits at in the tupperdor. I'm a little worried because we returned from Cuba on Wednesday and the bovedas won't be in until Sunday I think. But the cigars should be fine until then right? And then once I can introduce them to the right environment they should stabilize out. @Heavysetrapier, I'd get them in the freezer to kill the larva if any is in the cigars, will give you plenty of time to get 65% Boveda in, there's a thread on here somewhere about the procedure on how to freeze them. Yeah 72's are steep, will work if you have any Spanish cedar that needs seasoning though. I've personally found Bovedas 72's are more like 74-75% range, their 65's have been spot on though. Nothing irritates me more than a cigar the burns bad do to high humidity. Heard that @TX98Z28. What I'm saying is that at least I'll have the 72s to regulate rh until the 65s come in. "For time being". Go ahead and plan on buying a cooler next week so you are not going through this again in a few months. Ok time for another question. So I took the suggestion from @TX98Z28 and put some boveda 65s to store my cigars but now it seems that when I go to smoke them I have trouble with them like they are too wet. Is that because they are absorbing the moisture from the humid environment outside of the Tupperware? @Patrickbrick suggested taking the cigar out and letting it acclimate to the environment for a while before I smoke it but I don't always have that heads up before im going to grab a smoke. Would it be better to put some boveda 69s to keep the cigars close to the humidity outside where I will be smoking them so there is less of a difference? Or am i just doing something else wrong? If your using 65% Boveda's they should be smoking great. I keep everything at 65% and I have never had an issue and it can get humid here outside as well. Sounds like u may have a sealing issue with your tupperware or something. If they are wet try dry boxing but they should be drying out, not getting wetter with the 65%. Are u using a hydrometer? What is it reading if you are? Whenever I get cigars from vendors I will smoke them once the band is loose and the cigar has shrunk. That tells me they are ready to go. May not work all the time but I use this as a general rule. Most cigars arrive spongy etc. If you are steady at 65% they should be smoking great IMO and since I see mostly cuban weed in there, 65% is optimal. It's going to take some time for all the cigars to get to a true 65% RH. I would say months, the longer the better, especially with them being in there with 72 Bovedas before the 65's went in. I would not recommend letting your cigar sit out unless the indoor humidity is less than 65%. I run in to the same problems still on certain days (mainly during all of summer for me, 6 months of the year lol) the RH outside is like 85%+ then the cigar burns like $hit. Also the humid air is being sucked in to the cigar while smoking it and the thin wrapper is quickly saturated with the high humidity also. What are the dates on the bottom of the Montecristo box? Depending on the box date I'd wait 1-2 years before smoking those. Cubans are so massed produced they need some time on them before smoking, let that ammonia in the tobacco out gas, theres a reason full bodied cubans do not have cellophane on them. Heres my neighbors recommendation, he smokes everyday and only smokes cubans he has ALOT of them. Keep at 65%RH, age them a minimum of 1-2 years before smoking. His house is an 8 min. walk from me so he's exposed to the very humid outside air also, I think he has some fans out side to move the air around when smoking also. What @miller65rod, said about the bands loosening is a very good rule when the cigars are where they should be humidity wise. Heard that @TX98Z28. I'm not talking about the Cubans. I'm talking about the other cigars. @miller65rod my hydrometer reads 65%. I don't think they are too wet in the Tupperware. I'm wondering if they absorb the humidity that quick when I take them out to smoke them. At night here it's 85+ humidity. Thanks for the input. I'll just keep going till I figure it out. @Heavysetrapier, Same rules apply to all your cigars, especially with you stating the outside humidity is 85+% outside when smoking. Having 65% Bovedas in there for 2 weeks isn't going to cut it, wait 2 months or more and see if theres any change in how they smoke. I'm trying to help you man, be patient. Cigars take time to get good, burn good, smoke good. So let's look at the cigar from a science aspect. You have the cigar at 65% in the tupperdore. You take it out, then immediately, the filler starts to pull moisture, because it has way more fibers than the wrapper. Now, you have a wrapper that is still in the 65% area and a filler that is wicking humidity. Now you light it. As you heat up the filler, the moisture in it expands. Heated water can expand 10+ times it's size. Now, this is where everything goes south. There is pressure on the wrapper (this is where cameroons explode) and the flavors and oils don't want to intermingle the way they normally would and flavors are then off. This is the best way I can explain it without making my head hurt. LOL! Right @0patience my question is what's the best remedy for that? Because you can't change the humidity outside of the box?